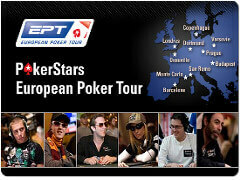 The European Poker Tour has visited Barcelona, Spain since Season 1, and the EPT Barcelona is one of the most prestigious and well-attended events on the EPT schedule every year, and even last year, when Black Friday had the poker world handcuffed the Barcelona stop attracted over 800 runners – down from recent years but a still respectable number. This year Barcelona led off the Season 9 schedule, and with well over 1,000 entries (we are still waiting on the official head count) the EPT Barcelona Main Event has rebounded quite nicely after last year’s disappointing turnout of just 810 players. Just over 400 players, 403, registered on Day 1a of the tournament, and on Day 1b the tournament hit its cap with 640 entries (several players are now on the Alternates list waiting for a seat in the tournament), which should produce one of the biggest prize-pools of any tournament in 2012. The turnout is a spectacular rebound for poker, which has seen smaller and smaller fields dating back to before Black Friday, and the timing has me wondering if the announced repayment of Full Tilt poker players after over a year of waiting has anything to do with the attendance numbers? Not only did the EPT Barcelona draw in over 1,000 players, but the Estrellas Poker Tour (which has been merged with EPT stops to create poker tournament series) saw its Main Event, a €1,000 buy-in NLHE tournament, attract over 1,000 players as well, topping off at 1,033 entrants. And all of this is happening while the Legends of Poker tournament series surges towards its Main Event in a few days, and a WSOPC stop in Biloxi, Mississippi plays out. Of the 403 players that registered for the EPT Barcelona Main Event on Sunday’s Day 1a only 222 survived the frenetic pace, and now await the survivors of . Other big names that survived Day 1a included John Juanda, Pius Heinz, last year’s EPT Barcelona champion Martin Schleich, Juha Helppi, Dani “Ansky” Stern, Leo Margets, Sebastian Ruthenberg, and Sami Kelopuro. We will have a complete breakdown of the two starting days in tomorrow’s report and will also have a the final numbers for the prize-pool and payout structure of the tournament.